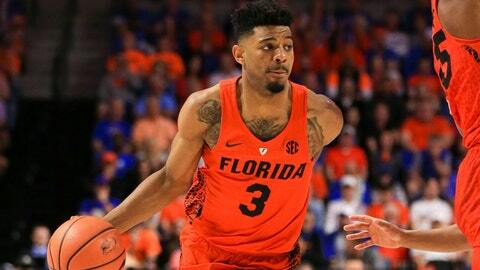 Florida guard Jalen Hudson, the team's leading scorer last season, will return to school for his senior year. GAINESVILLE, Fla. (AP) — Florida guard Jalen Hudson, the team’s leading scorer last season, will return to school for his senior year. Coach Mike White says the 22-year-old Hudson delivered the news Tuesday after talking with his family. Hudson declared for the NBA draft in late March, but didn’t hire an agent and left open the possibility of staying in school. Hudson wasn’t invited to the NBA Combine and was told he wouldn’t get drafted. The 6-foot-6 Hudson averaged 15.5 points in his first season playing for the Gators. He transferred to Florida in 2016 after two years at Virginia Tech, where he averaged 7.7 points. Hudson’s return will help, with the team replacing guards Chris Chiozza and Egor Koulechov and center John Egbunu.